It has been a crazy week at work and it has robbed me off any available time to ideate and write. In fact there are quite a few topics in the pipeline about which I was planning to pen (rather ‘key’) about. But before that there is a very heartening update that I had wanted to share this week. My blog post on The Best Touch Points in India for marketing Fabric Conditioners, has been referred to the Category Innovation Head of the Indian arm of my company! One of my manager’s at work has seen this post and has found it to be very interesting and has forwarded to the people concerned for the evaluation of the idea. I do not know if this idea would be a reality (as the ground realities, legal and govt. technicalities involved could be challenging for a smooth implementation of this idea). But I felt extremely humbled when I discovered that some bytes of my ‘noise’ have actually become worthy of ‘that’ level of attention. Though my blog has been a very recent endeavor, almost every post of mine has been commented/discussed by many learned people around – some in the company that I work for, some very famous bloggers, some FMCG enthusiasts, some marketing evangelists, some friends and some well wishers. I feel inspired at every such occasion and it makes me take my learning even more seriously and my ignorance even more seriously. Thank you everyone. This reminds of a very famous live by Steve Jobs. 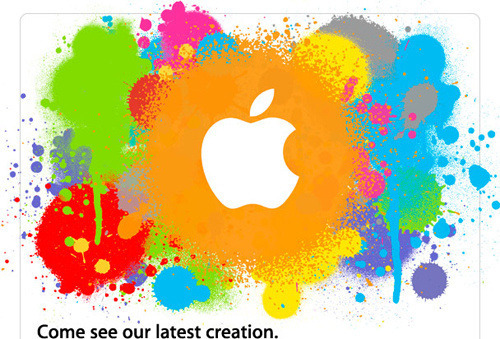 For example the following was the invite that was sent by Apple about the event to be held on January 27 at 10am PST. “In reference to the new invite, notice that some of the paint splotches were created while the “canvas” was laying flat while some of them are dripping as if to indicate an upright orientation during that part of creating the image, the last orange splotch is flat again. Let’s see what it would be on the 27th.